On December 12th, we celebrated the feast day of Our Lady of Guadalupe, Patroness of Latin America and special patroness of the group "Sanctuary of Life". That morning, the Servant Sisters of Chone and some youth joined up with a caravan of cars that accompanied in procession a beautiful image of Our Lady of Guadalupe that is 1 1/2 meters high. We started out from Chone's stadium heading towards Rancho Viejo, an hour drive from home. After 45 minutes, we stopped and got out of the cars, lifted up the platform with the image of Our Lady, and began to walk praying the Rosary, singing to Our Lady and throwing flowers and rose petals. Our destination was the chapel, still under construction, dedicated to Our Lady of Guadalupe in Rancho Viejo. This chapel is being built in thanksgiving for the healing of a young girl who had cancer. 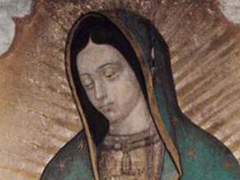 Her mother prayed to Our Lady of Guadalupe for her, and she was cured. This is the second year that the pilgrimage has been done. Besides this, Cecilia, the mother of the girl, has worked to bring catechists to this place to be able to prepare the children of the area to receive the sacraments. When we reached the chapel, we were met by a group of 19 children and adolescents who were going to receive their First Holy Communion. There was an atmosphere of celebration to it all. The background music of the song "La Guadalupana", to Our Lady, accompanied us while we walked in procession, and the love of the Blessed Mother was seen on the faces of all those present. All this prepared our hearts to joyfully celebrate the feast day of Our Mother. We helped the parish priest organize the ceremony. While he heard the confessions of the boys and girls who would recceive their first Communion, Sr. Leticia - as the good Mexican she is - told us the story of the apparitions of Our Lady of Guadalupe to the Indian Juan Diego. We practiced songs with the congregation and we were all able to enjoy this great day. We also were able to practice the virtue of patience, because, although the Mass was supposed to start at 9:00 a.m., in the end it didn't start until 10:45. When we arrived back home, the youth of the Home of the Mother who had accompanied us wanted to celebrate it by inviting us to a delicious Ecuadorian meal that they put together in a short time. In the afternoon, we got together with the group "Sanctuary of Life" so that their members could renew their commitments. 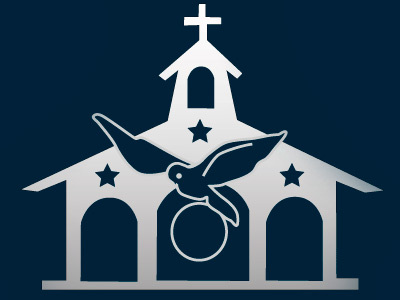 "Sanctuary of Life" is a pro-life group whose goal is to defend the sacred dignity of all human life from the moment of conception until natural death. To finish off, Sr. Leticia did not want the day to pass without inviting us to a mexican meal: molletes, guacamole with tortillas and mexican salad. 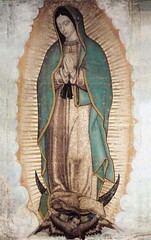 Our Lady of Guadalupe, Mother of the true God for whom we live: pray for us.